Made our first stained glass night light test run today and it felt great! To top off the excitement it was Natalie’s first stained glass project and design! There was quite a bit of leftover glass from my previous panel so we had a lot to work with. So pleased with the way it turned out. Funny how some smaller accomplishments can feel more significant than larger ones. In other exciting news I plan on making a grip of these for Fort Mason Renegade Craft Fair in November. Stay tuned!! Started a new light box today for a group show in June! The concept of this show is to interpret the painting below how ever you'd like. OK everyone, I’m really dang excited about my new soldering exhaust set up! If you’re not interested in stained glass soldering exhaust systems I would definitely skip this entire post. If you’re interested in setting up your own soldering station at home, you should read this! I spent a lot of time researching the perfect exhaust and I couldn’t be happier. I decided to go with this set up below, all available on Amazon (I linked each image to their amazon page). It was really important to me get the hobby kit extension because it allowed me to make the gap out my window smaller. The plastic hobby hose is extremely sturdy and holds it shape well. It was definitely more expensive than just a regular aluminum foil vent but I will be using it often and I think it was worth the extra couple bucks. I also chose to go with the grower exhaust fan because it is really quiet, can be taken apart easily and has a built in base making it a bit sturdier than the other ones i’ve seen online. Stained Glass Painting Series "Where The Putty Hits The Glass"
Here’s a progress photo of my fourth window in my new series of glass paintings When The Putty Hits The Glass. This is going to be a grouping of 10 glass panels that are meant to accompany the rugs i’ve been working away at. Here are a couple small composition sketches I made the other evening when studying David Hockney’s landscape watercolors. When i’m looking for inspiration I tend to sketch paintings I love. It helps me gain understanding and break the fourth wall separating me (the viewer) from the artist/maker. If you haven’t checked out Hockney’s recent paintings I would highly recommend doing so! He is unbelievably talented and his later work is so different from what he was originally known for. Here’s my most recent panel - I’ve been keeping this one under wraps because it was a surprise BUT i just spilled the beans! This panel references a quick lil sketch I finished a few months back. Signed the lease on my new studio this afternoon. I am officially part of the Dogpatch Collective! Watermelon Mint Mojitos at The 500 Club! Today I stayed home, drew an old napping dog named Sparky & finally found a home for some stained glass my dad made. The bottom tulip piece was from an old building on Chicago's South Side that he re-leaded and the piece above was made with antique leaded glass. I am very happy to have these here with me in San Francisco. Last week I sat in on a figure drawing session with Joe Steiner and a model he's been painting for over 10 years. Joe, now in his 70s, has identified as an artist his entire life. His daughter, Lisa (also a painter) and my mother we're great friends growing up. The Steiner family paintings were some of my first introductions into the art world. When my sisters and I were younger, we threatened to run away and sleep under an apple tree. Not long after our threat, Joe, Lisa and my mom were in our bedroom sketching out a huge apple tree that stretched from the floor and bent up onto the ceiling. I helped paint the apples and when we were done we put our beds underneath. 20 years later I find myself in Joe's basement in Skokie, Illinois, again, drawing together. Many of his models are from the south side around his old studio on Howard Street. Instead of paying to lug his setup to a figure drawing studio, he invited people from the neighborhood to sit and pose for him in his own studio. You can see some of Joe's paintings on his website. Over the past two weeks I've found myself sketching my grandmother, Joan. 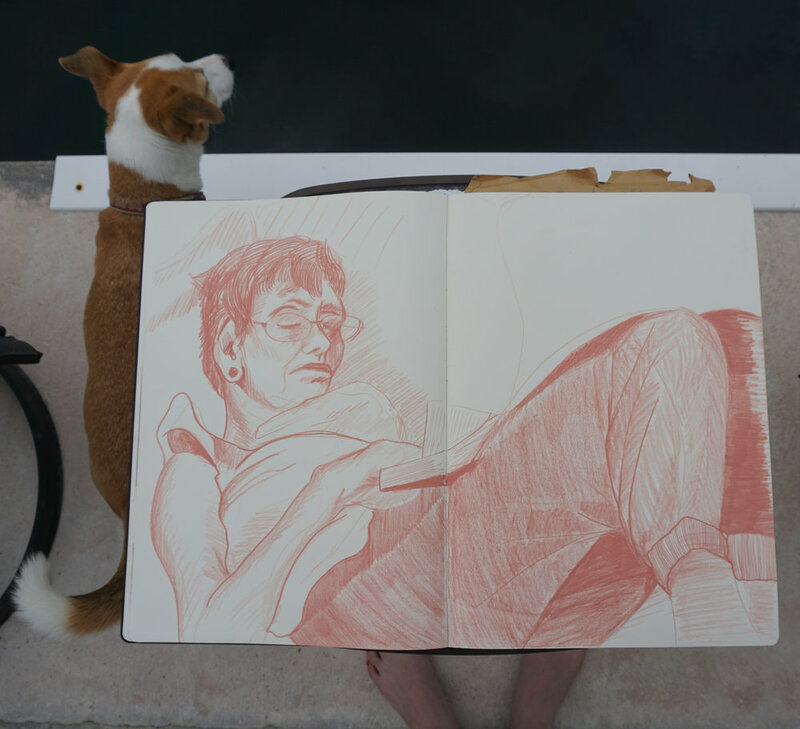 Here are some of the drawings I've made of her napping, during cocktail hour and while watching the sunset on my parents boat.